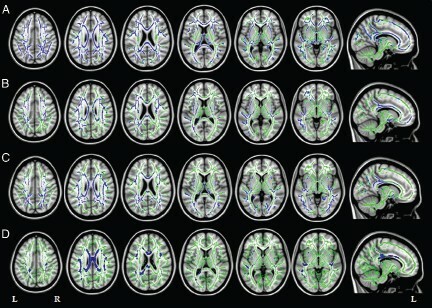 June 1, 2015 -- Using diffusion-tensor MRI (DTI-MRI) to identify damaged white matter in the brain may help pinpoint the early onset of Alzheimer's disease, as well as the start of two atypical forms of the condition, according to a new study published online May 27 in Radiology. Italian researchers found severe, widespread damage and cortical atrophy among individuals with Alzheimer's disease and those with primary progressive aphasia and posterior cortical atrophy, due to DTI's proficiency in detecting white-matter degeneration. "The cognitive profile of each group of patients highly reflects the distribution of cortical atrophy and the patterns of white-matter tract damage," wrote senior author Dr. Massimo Filippi and colleagues from Vita-Salute San Raffaele University in Milan. DTI-MRI "has the potential to allow assessment of the extensive disorganization of brain networks in [atypical] Alzheimer's, even before overt cognitive deficits become apparent" (Radiology, May 27, 2015). Alzheimer's is associated with abnormal beta-amyloid plaques and tau tangles throughout the brain. Previous studies have speculated that beta-amyloid plaques accumulate in vulnerable brain networks and spread through white-matter connections to otherwise unaffected regions. Typically, patients with early-onset Alzheimer's show impairment in several regions of the brain before age 65 and experience executive functioning, visual, and spatial difficulties. Primary progressive aphasia and posterior cortical atrophy are atypical forms of Alzheimer's and can also cause visual problems or language deficits. What researchers have not been able to confirm is where or how the disease process begins. However, early-onset Alzheimer's, primary progressive aphasia, and posterior cortical atrophy "offer an ideal framework for exploring Alzheimer's disease pathologic changes in terms of altered brain cortical and white-matter networks," the authors wrote. Filippi and colleagues used DTI to assess white-matter tracts in 28 patients with early-onset Alzheimer's, 12 with primary progressive aphasia, and 13 with posterior cortical atrophy. The 53 patients were matched in terms of age and gender with healthy control subjects for comparison purposes. The researchers used a 3-tesla MRI scanner to perform 3D T1-weighted fast field-echo and DTI sequences on all subjects. DTI-MRI measures the movement of water molecules to characterize the microstructure of biological tissues and detect white-matter abnormalities. Axial and sagittal MR images show mean diffusivity results in patients with Alzheimer's matched with healthy controls. Increased mean diffusivity is seen in those with early-onset Alzheimer's (A), primary progressive aphasia (B), and posterior cortical atrophy (C) compared with the healthy controls (D). Image courtesy of Radiology. All three groups of Alzheimer's patients showed a common pattern of white-matter damage in the corpus callosum, fornix, and main anterior-posterior pathways, as well as cortical atrophy of the left temporoparietal regions and precuneus, the researchers found. In each group, the patients' cognitive profile strongly reflected the patterns of cortical atrophy and white-matter damage. Individuals with early-onset Alzheimer's disease exhibited severe cognitive impairment regarding verbal memory (100% of patients), visual and spatial memory and abilities (96% of patients), and executive functions (83% of patients). Patients with primary progressive aphasia also presented with verbal memory problems (87% of patients) and visual and spatial difficulties (50% of patients), while all of the subjects (100%) with posterior cortical atrophy had significant deficits of visual and spatial abilities and memory and executive function. In the two atypical Alzheimer's groups in particular, white-matter damage was worse and more widely spread than expected based on cortical atrophy. Filippi and colleagues suggested that the damage may spread through white-matter tracts from atrophied regions to previously unaffected cortical areas. The researchers also compared fractional anisotropy values between the healthy controls and those in the atypical Alzheimer's groups. In healthy white matter, the direction of water movement, as measured by DTI, is fairly uniform and results in high fractional anisotropy values. When water movement is more random, fractional anisotropy measurements decrease, indicating there might be some microstructural abnormalities. In the patients with primary progressive aphasia, fractional anisotropy decreased in certain regions of the brain's left hemisphere, as well as in a small area of the frontal white matter in the right hemisphere. Patients with posterior cortical atrophy showed a symmetrical pattern of fractional anisotropy decrease, as well as diffusivity increases in several brain regions. "The most important finding of the present study is that white-matter damage was more severe and more widely distributed than expected on the basis of cortical atrophy and the cognitive profiles, particularly in the atypical Alzheimer's disease forms in which cortical atrophy remains localized and the clinical symptoms relatively focal," Filippi and colleagues wrote. The severe and widespread white-matter damage among patients with the two atypical forms of Alzheimer's "cannot be explained solely by gray-matter atrophy, which was more localized," said co-author Dr. Federica Agosta, PhD, in a statement. "DTI has the potential to assess the extensive disorganization of brain networks in [atypical] Alzheimer's disease even before overt cognitive deficits become apparent." The findings emphasize the importance of identifying and diagnosing patients with early-onset and atypical Alzheimer's disease, Agosta added. "Because there is not much structural damage in the early stages of [atypical] Alzheimer's disease, there is a risk that patients may be misdiagnosed and excluded from clinical trials," she said.